Our formula says it all! Glucose & Fat Metabolism, Thermogenesis, Insulin Sensitivity Improvement…who needs more? Fumaric Acid (L-Carnitine Fumarate = L-Carnitine + Fumaric Acid) will give an amazing boost to your glucose and fatty acid metabolism. This is how this amazing ingredient will increase your energy levels during training and during the day. 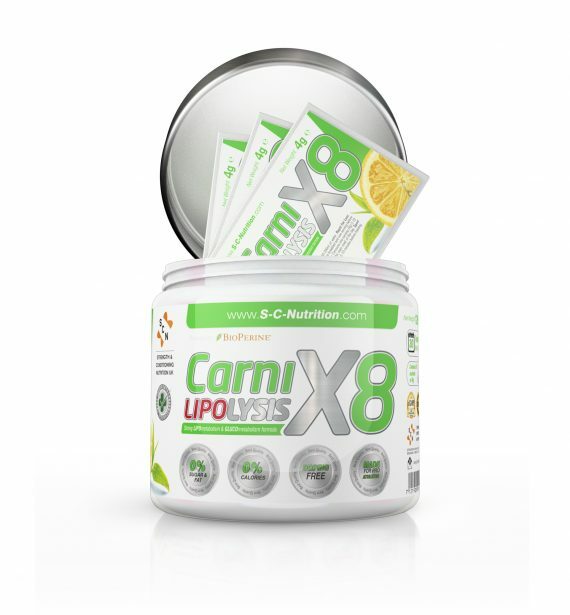 CarniLipolysisx8 is a unique supplement developed by SCN’s science team. Inositol is a vitamin-like substance that is produced naturally in the body. Although supplementation is popular, before increasing the amount of inositol in your diet, it is best to understand what it can do. Inositol is a pseudo-vitamin chemical compound, which was earlier known as vitamin B8 and considered part of the B complex vitamins. However, once it was discovered that our body can make its own inositol, it was no longer considered a true vitamin. Inositol is a sugar alcohol with six hydroxyl groups, and myo-inositol is what this sugar alcohol is converted to in the brain. Some health conditions cause the body to produce less of this compound, so supplementation is occasionally required. That being said, you can also eat certain foods to increase your levels, such as brown rice, citrus fruits, nuts, wheat germ, green leafy vegetables, cereals, soy flour, and whole grain bread. Lecithin granules and other sources of lecithin are also great sources of this vitamin-like substance. Inositol is found in high concentrations in the brain where it works closely with various neurotransmitters and therefore, is most commonly associated with neural functions. While this is the main aspect of health linked to this chemical, there are many other impressive health benefits you can enjoy by ensuring you have enough of it in your diet. We use the highest available purity of Green Tea Extract, the 30:1 98%. This means that you take 500mg of extract that is equal to 15.000mg of herb. Green tea is one of the most commonly consumed teas in the world. Green tea extract is its concentrated form, with just one capsule containing the same amount of active ingredients as an average cup of green tea. Like green tea, green tea extract is a great source of antioxidants. These have been credited with a range of health benefits, from promoting heart, liver and brain health to improving your skin and even reducing the risk of cancer. What’s more, many studies have looked at green tea extract’s ability to aid weight loss. In fact, many weight loss products list it as a key ingredient. A massive dosage of 1000mcg (1mg) will make your fat disappear real fast. Chromium picolinate is a form of the mineral chromium that can be found in fat loss supplements. This mineral, helps people to reduce hunger feeling and reduce food intake. There are several clinical research that support the effectiveness of Chromium Picolinate on reducing hunger and losing weight. Chromium picolinate may also benefit your heart health, according to a study published in “Pharmacological Reports” in 2010. Researchers examined the effects of chromium picolinate against several markers of heart disease, including elevated blood pressure and abnormal vascular function. Makes all other ingredient work better!! This what “natural bioavailability enhancer” means. WHAT IS IT AND WHY IS IT IN FAT BURNERS? Bioperine is a plant extract derived from two types of pepper plants, namely, long pepper (Piper longum) and black pepper (Piper negrum). The natural chemical compound is a patented product made from the standardized piperine extract from the above mentioned pepper species. BioPerine® from Sabinsa (East Windsor, NJ) is a patented standardized extract from black pepper, containing not less than 95 percent piperine. Pharmacological studies have shown that piperine reduces inflammation and pain, possesses anticonvulsant and antiulcer activity, protects the liver, has deleterious and antioxidant activity. Results from previous studies demonstrated that piperine showed anxiolytic and antidepressant like activity. Piperine also inhibited monoamine oxidase (MAO) activity, and increased the levels of noradrenaline and serotonin in some regions of the mouse brain. All of these characteristics make it perfect for the dieting male or female, but more importantly, it is a clinically proven bio availability enhancer for nutrients. It shows increased blood supply to the GI tract, increased emulsifying content of the gut and increased active nutrient transport. According to the Merck Manuals, bioavailability is the extent and rate within which an active drug enters systemic circulation after passing through the first-pass metabolism sites, namely, the intestinal wall and liver. Bioperine has been shown to boost the bioavailability of nutrients, namely beta-carotene, vitamin B, B6, vitamin C, selenium, and co-enzyme Q10, and other ingredients found in various supplements — including male enhancement supplements. According to research conducted by the manufacturer, bioperine substantially increases the absorption of selenium (30%), beta carotene (60%), vitamin B6 (140-250%) as well as coenzyme Q10. So if your fat burner does not contain bioperine, it should as its clinically been found to enhance the active transport of nutrients and based on a study, it enhances the effect of caffeine. Mix one sachet (4g) in 150-200ml of water. Fat Loss/Maintenance: Consume one serving (4g) 5-10 minutes before breakfast or one serving before the main meal of the day. Sport Performace: Consume one or 2 servings (4g – 8g) 5-10 minutes before training. We use no sugar, no fat, no colors or chemicals, no animal ingredients. This product contains no Gluten. Pharmaceutical Grade Ingredients 71%: L-Carnitine-L-Propionyl, L-Carnitine-L-Tartrate, L-Carnitine Fumarate, L-Carnitine Acetylated, Bioperine® (Standardized to 95% Piper Nigrum extract), Green Tea 30:1 Extract (Standardized to 98% Polyphenols), Inositol, Chromium Picolinate. Other Ingredients: Lemon flavour powder, Sucralose, Silicone Dioxide. Important Note: Supplements with high concentration in L-carnitine and no preservatives, may turn from powder form to solid form. This is a natural effect of ingredients which are extra sensitive in humidity. Consume the product in 20-30 days after opening. Keep in a dry and cool place always with the lid well closed. Do not use wet hands or tools to take the scoop from inside the tube.